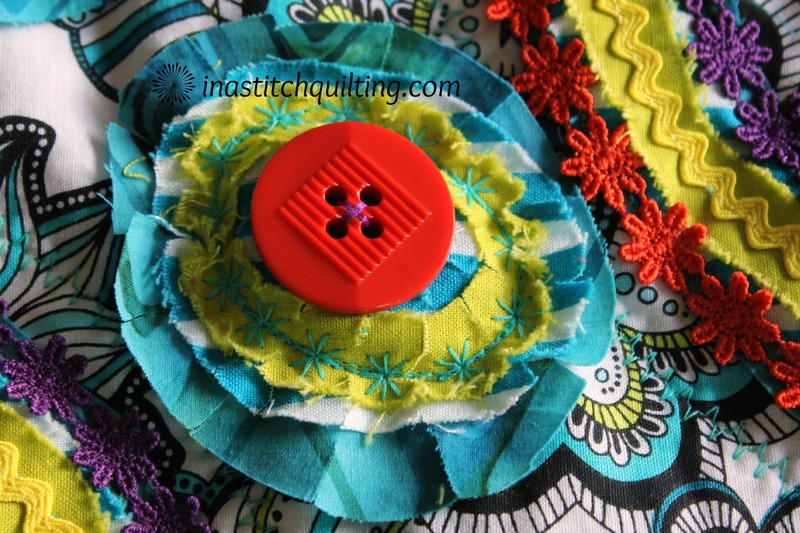 Just because I am a quilter doesn’t mean it is the only thing I like to do. I’ve been a student of several Craftsy Classes. One of my all-time favorites is Stitch & Slash by Carol Ann Waugh. To-date I have successfully used the knowledge I gained to make two wall hangings. I will share one of them with you today. Part of the fun of creating a Stitch & Slash item is selecting the fabrics. Carol Ann does a wonderful job of presenting the color theory behind the thought process. She walks you through the analysis one must consider when not only choosing the colors and patterns of your fabrics but also the order in which they will be stacked. For my project I chose four different fat quarters. I typically gravitate toward lively, vibrant colors so the four I chose definitely fit that trait. The most audacious of all was the loud blue, lime and black floral print showcased on a white background. Using this fabric as the jumping-off-point I selected colors to coordinate. With my four fabrics chosen it was time to decide in which order they would be stacked. One by one I auditioned each one as the main or bottom piece. After much consideration I arrived at the conclusion that the liveliest of them all would be the base. Next to be placed was a blue batik then a blue and white striped piece and the icing on the cake was a noisy lime green. 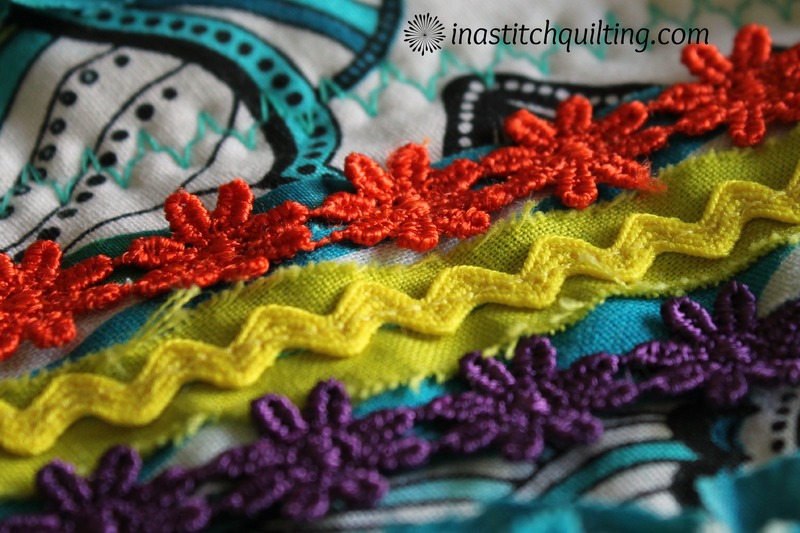 Long before contemplating my fabric selections I began visualizing both in my mind and on paper the stitch pattern I would use to secure my four layers together. The lines stitched, with my machine, would be like that of strokes made by the bristles of a brush. Designs from simple wavy lines to elaborate floral patterns were explored. My mind meandered through a trail that eventually came to rest on a simple combination of wavy lines and elongated circles. Having settled on a design it was time to sew my fabric sandwich together. The Stitch & Slash technique utilizes two different stitches; structural and textural. 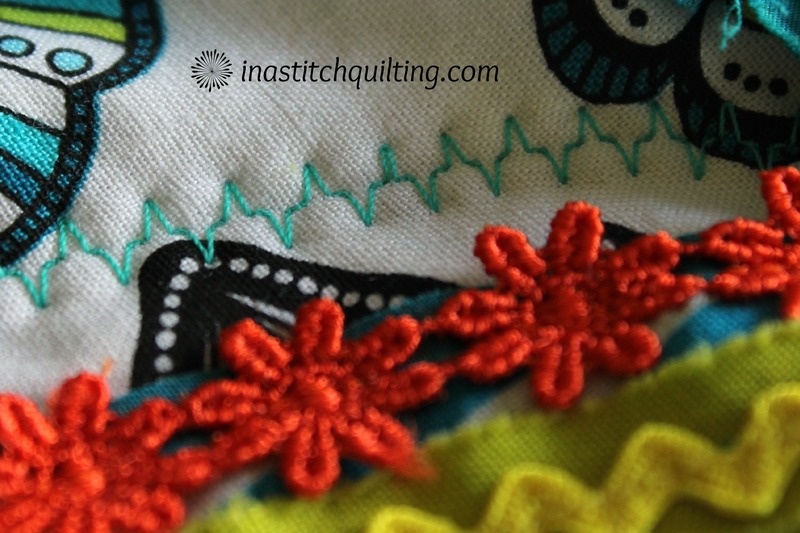 The structural stitches are sewed on the backside of your fabric sandwich. The bonus of stitching from the back is that you can pre-mark your stitching lines/design using whatever marker you prefer and nobody will ever see them. The drawback or important thing to remember is that because you sew these lines from the backside your bobbin thread is what will be seen on the front. Make certain your bobbin thread is the color you would like to see and that your thread tension is adjusted properly. 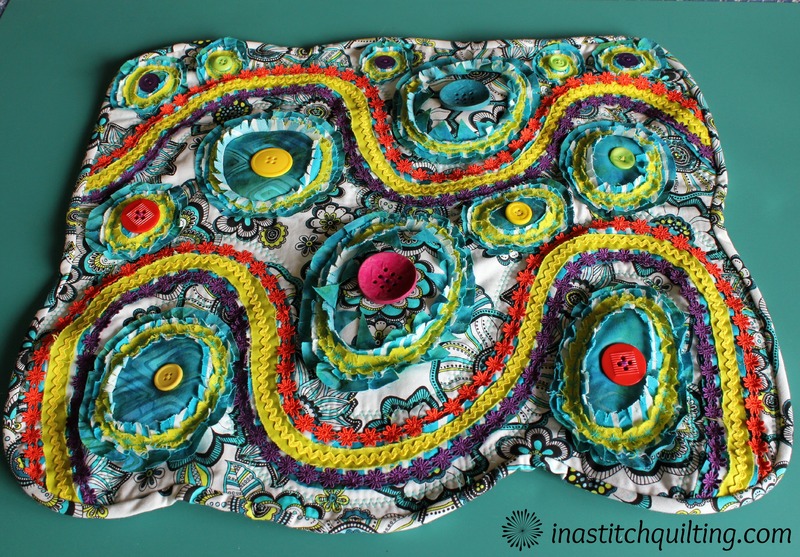 Once my structural stitching was complete my piece was ready for slashing, decorative stitching and embellishments. If you would like to learn the steps and techniques used to complete those tasks you can purchase the class from Craftsy. Decorating my projects, with embellishments, is one of my favorite things to do. I added decorative stitching, ricrac and buttons to mine. I also added stuffing in key areas to add a three-dimensional aspect. Any type of stuffing can be used. Being a long-arm quilter I just happen to have a huge inventory of batting scraps. I use those as my stuffing. To add the stuffing I made a small slit on the backside, in the area where it would be placed. Next I gently coaxed the stuffing in between the stitched rows using a chop stick. Once my stuffing was squeezed into place my project was ready for binding. I made binding from 2 1/2″ bias strips of fabric. I cut them on the bias because my piece had lots of curvy edges. Fabric cut on the bias is much more easily persuaded to form around those curves. Last to be added was a sleeve on the back to facilitate the hanging of my art piece. Well, there you have it. My finished Stitch & Slash masterpiece! I’m quite proud of the final outcome. I’ve named it Flowers In the Garden. https://polldaddy.com/js/rating/rating.jsVery nice! I love the colors in this one!